“I wasn’t supposed to bang with her, but she didn’t respect me, so I had to!” – Claressa Shields on winning her semifinal bout 29:15 over Marina Volnova. 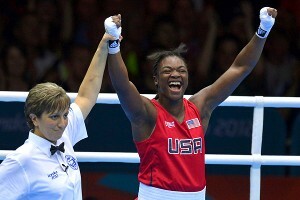 Claressa Shields wins the first middleweight gold medal in history by the score of 19:12!!! 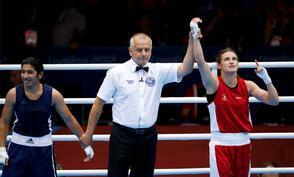 Well it’s down to this, the first women’s Olympic boxing finals in history. 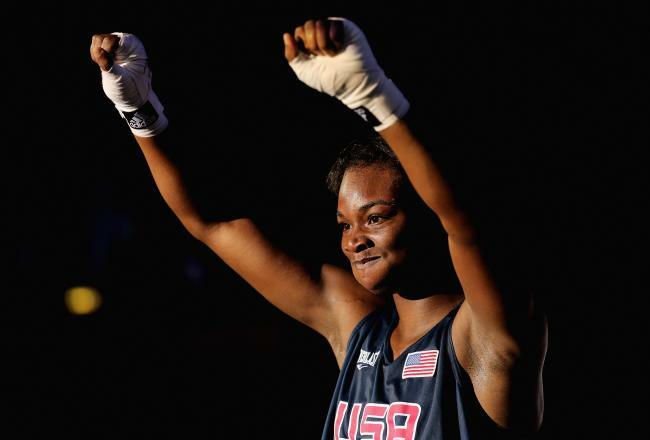 Fighting for the gold for the United States will be middleweight Claressa Shields who put the proverbial “beat down” on Kazakhstan’s Marina Volnova by the score of 29-15 after rocking her to an eight-count in the third and forth rounds. Claressa’s opponent will be Russia’s Nadeszda Torlopova who defeated Li Jinzi by the score of 12:10 in a somewhat lackluster contest. Claressa has that effect. She’s infectious and has the same kind of star quality that makes putting her in the company of boxing greats seem like the most natural thing in the world. She’s also promised to bring home nothing less than gold — and knowing Claressa, she probably will. In the Flyweight division, China’s Cancan Ren who defeated the USA’s Marlen Esparza by the score of 10-8 will take on Great Britain’s Nicola Adams who won her semifinal match against India’s Magnificent Mary Kom by decision 11:6. Marlen Esparza and Mary Kom will both be awarded the first women’s flyweight bronze medals for women’s boxing. Both performed their best and should feel proud of their place in the evolution of the sport. 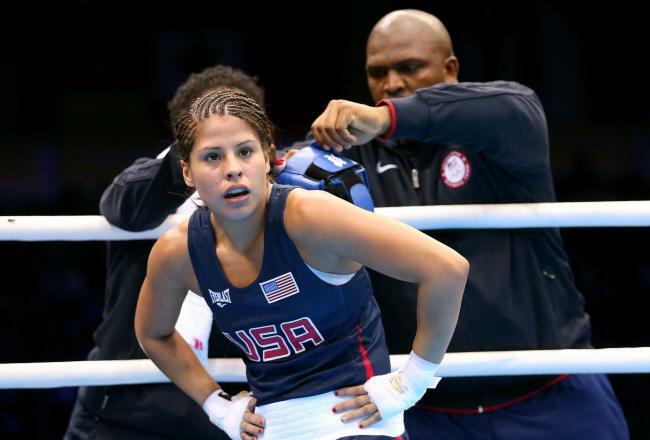 Marlen has been a fierce competitor and a model of selfless achievement in the American amateur boxing community. And as for Mary Kom — having boxed in the first ever AIBA World Women’s Boxing tournament in 2001, she has persevered in the sport she loves to become an Olympian. Ireland’s wildly popular Katie Taylor the reigning world champion in the Lightweight division handily defeated Mayzuna Chorieva 17:9 to earn her berth in the finals. She will face the number two seed, Sofya Ochigava from Russia who defeated the Brazilian fighter Adriana Araujo, 17:11. Katie is a veteran amateur fighter who has long been lauded as the best of best. She also works tirelessly for women’s sports in her native Ireland and has become so beloved that she led the St. Patrick’s Day Parade in Dublin in 2011. Whether these remarkable women win silver or gold — they each have stories to tell of how they made their way through the labyrinth of training, competition and the dings that life threw them along the way. As women they are trailblazers in a sport that more often than not has neglected their presence or worse attempted to meddle in such things as whether they should wear skirts. Still they have boxed their way into the hearts of their fans — and new ones who are being won over by the poise, skills and temerity of these athletes. 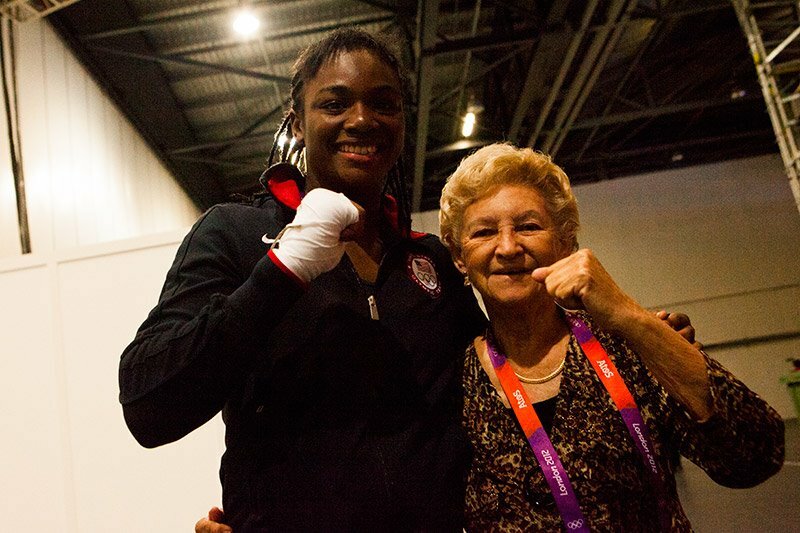 As you watch the women’s Olympic boxing finals today remember that you are part of history — and then send up an extra loud cheer for the sheer guts that these women embody as they step into the ring! Don’t watch the Finals on your own! Cheer on with a terrific web chat! Join Girlboxing, Sarah Deming and 2012 World Champion Tiara Brown and producer Marianne McCune online with WNYC.org Radio’s online chat as part of the WomenBox coverage! The festivities get underway at 11:30 AM (EDT) in the US. Link to the chat is here. Great articles from around the web!